Many pioneer settlers of Ray City, GA served during the Civil War. While the men were away at war, confederate women were left to deal with the business of operating farms and agricultural industry. But during and after the war, the economy of the south was completely disrupted. During the four years of the war, commodities like flour went from $8 a barrel to $250 a barrel. Brown sugar went from 7¢ per pound to $12 per pound; by the last year of the war refined sugar could not be had at any price. By comparison the price of bacon increased a modest 18 fold, going from 21¢ a pound to $3.75. 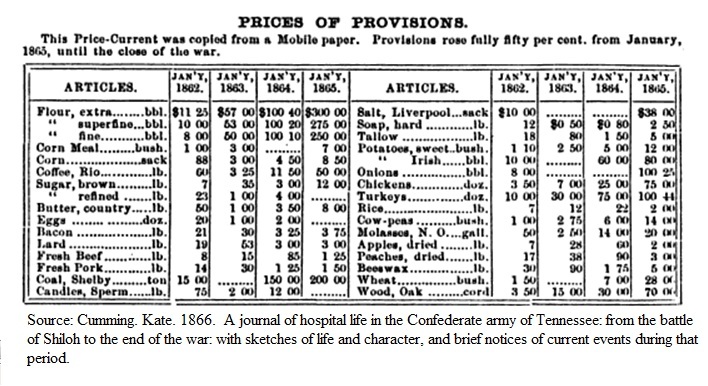 Table showing the dramatic increase in the cost of provisions in the South during the Civil War.